What did the pioneers of days gone by harvest and eat from the wilds of Michigan? 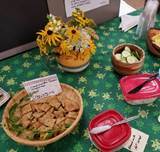 Join us at Grass River Natural Area on Saturday, November 17 at 1 pm for a picnic lunch of these timeless edibles to eat your way through history. You will learn about the wild foods that we can still harvest today and then get a little taste of the past. This 2-hour program is $8 per person. For more information visit grassriver.org. The entrance to Grass River Natural Area is at 6500 Alden Highway, Bellaire.